It was not the way the No. 16 Fordham University Football team (1-1) had wanted to open up play at home, but when you are facing the No. 6 Villanova Wildcats (1-1) one can expect a fight, and that it exactly what it was. For the Rams the offense was just unable to find a rhythm they were held to 182 yards, meanwhile the defense had a tremendous performance though in what will be a unit to watch for during the 2015 season. Chase Edmonds, who won the NCAA FCS Rookie of the Year last season, had an impressive performance for Fordham gaining 74 yards on 16 carries and caught four passes for ten yards, while Cory Caddle grabbed four passes for 49 yards and the score. Defensively, Jihaad Pretlow led Fordham with ten tackles, eight solo, including one for loss, while Caleb Ham made nine solo stops, including one for loss, and Niko Thorpe had seven solo tackles, including three sacks, and recovered a fumble. Overall the Fordham defense recorded 12 tackles for loss and six sacks. As for Villanova QB and NCAA FCS Player of the Year John Robertson looked very impressive going 12-of-18 through the air for 161 yards and a touchdown and ran 21 times for 49 yards and a score. Robertson gained 102 yards on the ground but was sacked six times which cut into his net yardage for the night. 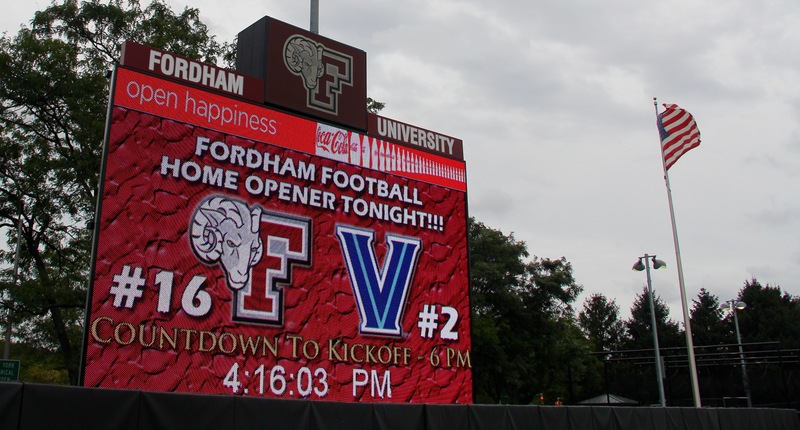 The Rams return to action next Saturday, September 19, as they host the Columbia University Lions in the annual Liberty Cup game on Jack Coffey Field at 1:00 p.m. in a game that will also serve as Homecoming for Fordham.